So what have I been up to now? I am always dreaming up new ways to help you sort your IBS issues and I have ONE MORE! This is such an obvious one that I am not sure why I haven’t thought of it sooner. I always make my clients fill out a daily diary with a whole raft of information so that I can analyze it and identify food triggers and weaknesses in their routines. This is fundamental information for getting to the bottom of their issues and eventually getting them symptom-free. Without everything down on paper, it is almost impossible to see the patterns and rectify the mistakes and it’s hard to build up a big picture of what is happening in your digestive system. This is one of the most important things you can do to help you eliminate your irritable bowel syndrome symptoms. You have to record what you eat and drink and your symptoms after each meal. On top of that you should be recording all the medication and supplements you take as well as your bowel movements. Also, a record of your sleep, exercise and relaxation periods will help you enforce good habits to support your IBS. I have created the perfect IBS Daily Journal for you which covers all these things. As a bonus, the first section of the book gives you invaluable information on all the areas I mentioned above so that you can fill in the journal in the full knowledge of why you are doing it. I hope you love this idea. I assure you your journal will become your new best friend. At the moment it is only available in PDF form, but you will be able to write directly onto it by using the Add Text tool. However, if there is enough request, I will consider publishing it as a hard copy, but I can’t guarantee it because it is a very long-winded process to make that happen. One of the ladies who is a member of the IBS Insider Club asked for a vegetarian soup recipe in the forum where they can make suggestions for future recipes. And here it is. It is a thick healthy meal in one – a soup which is both vegetarian and low Fodmap. The addition of a lot of toppings like coriander, almonds, feta cheese and paprika makes it full of texture as well as flavours. The corn chips around the side were an inspired addition once I saw how thick I had made it. It could be thinned out with more stock or lactose-free milk if you preferred a more runny mixture. It was so filling my son only got through half a bowl, and I had leftovers for lunch, which I love. 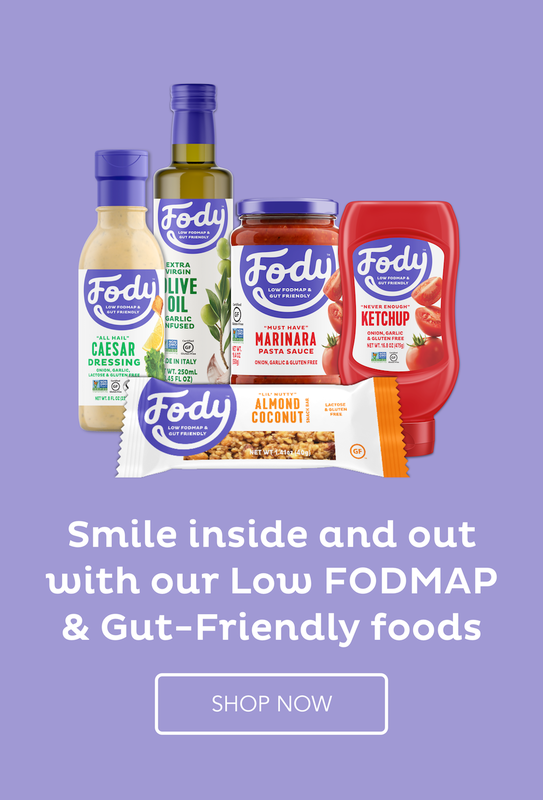 Do go easy though because it is fairly concentrated and you could easily go over the Fodmap allowance for the meal if you got carried away. I had about 1/3 of one of the bowls you see in the photo. The weather here has been cold and snowy, so soup speaks to me. This is terrific — so much flavor! Thanks for this. It is full of flavour and I love the crunch from the toasted almonds and the corn chips. LOL. I actually make sure I get 8 hours of good quality sleep each night. But I do work 12-13 hour days. I enjoy what I do but I will be able to scale back the development stage soon. Thanks for all the great recipes. I will definitely try this one on the weekends. I’ll let you know how it goes. I am not much of a chef but hope it goes well. It should be fairly straight forward – not too much can go wrong. I’d love to hear how it goes. Just make sure you don’t eat heaps though. Thank you for the recipe. It looks lovely. I have one question though. You said that we should not eat a big portion of this soup. Does that mean, I should eat less than one quarter of this recipe? But how then do I get enough calories to sustain myself till the next meal? It is a filling soup and you can get extra calories from the feta cheese , nuts and corn chips. I ate this for dinner and was quite satisfied and had not lost weight when I weighed myself the next morning.